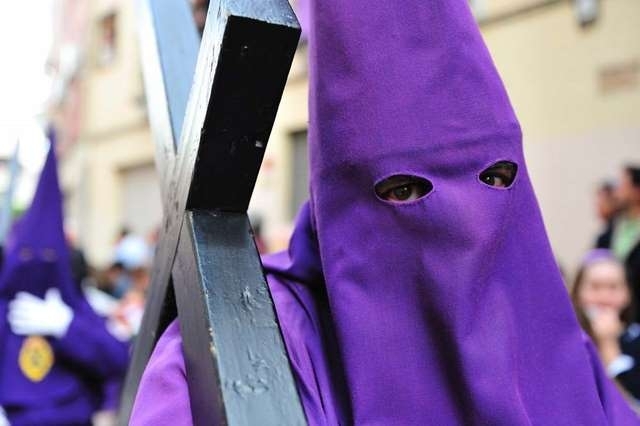 While each town, village and city within Murcia has its own traditions, and its unique way of celebrating Semana Santa, the Spanish term for Easter week, the essence of this week is a remembrance of the last week in the life of Jesus Christ, his crucifixion and resurrection. 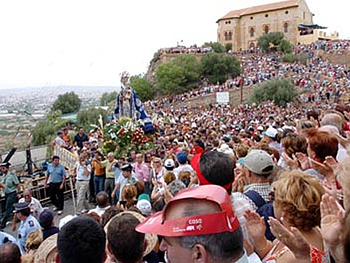 The main body of activities begin on Viernes Dolores, followed by Palm Sunday, then there are processions throughout the week culminating in the procession of resurrection on the Sunday morning, our Easter Sunday. 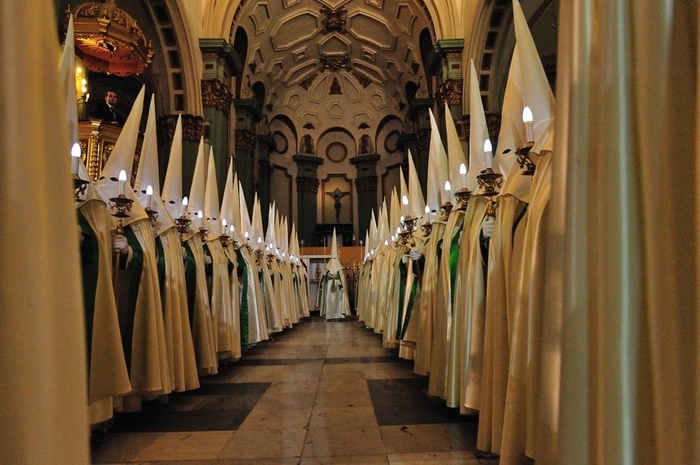 The Semana Santa ( Holy Week) activities, parades and religious programmes are all organised by the Cofradías, also known as Hermandades or Brotherhoods and many were established hundreds of years ago, although there are new brotherhoods being created every year. During the troubled times of the Spanish Civil War, and the turbulent times of change which beset Spain following the war, many Cofradias fell apart or were disbanded, and religious traditions discontinued, but Semana Santa and its rites have enjoyed a revival in the last few years, some Cofradias have reformed or new ones started up as Spain embraces its inherited traditions. 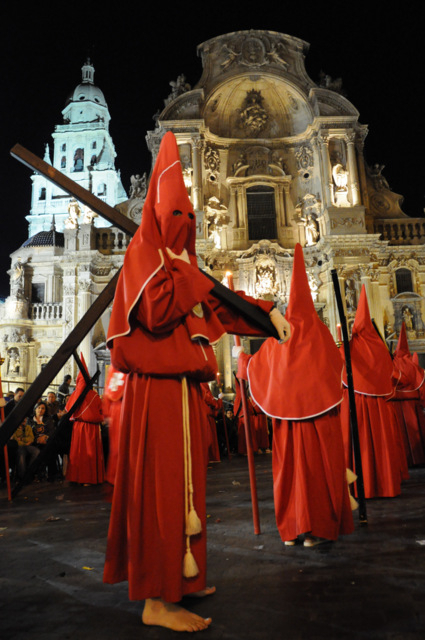 The larger Cofradias are subdivided into smaller "subdivisions", necessary as in some of the larger parades such as that of the Coloraos, the reds, in Murcia, 4000 penitents will walk together in the procession. 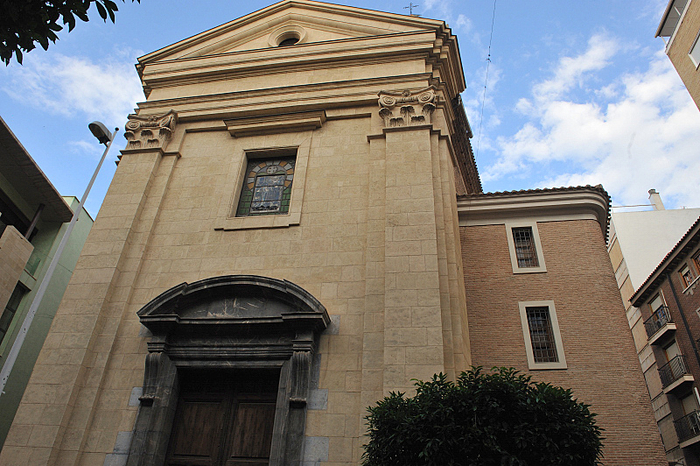 Each Cofradia has its headquarters where the sculptured pasos, statues which form the focal point of their processions are stored, often a church, and each Cofradia has its own pasos, embroideries and robes, all financed by the members of the Cofradía. There are three types of pasos, an allegorical scene or a scene of the passion of Christ, known as a misterio, then the images of Christ, and thirdly the image of the suffering Virgin Mary, known as a dolorosa. Some of these pasos are priceless, carved by the great masters of Murcia: youll see the name Salzillo cropping up from time to time, Murcias´s great Master of the Baroque. 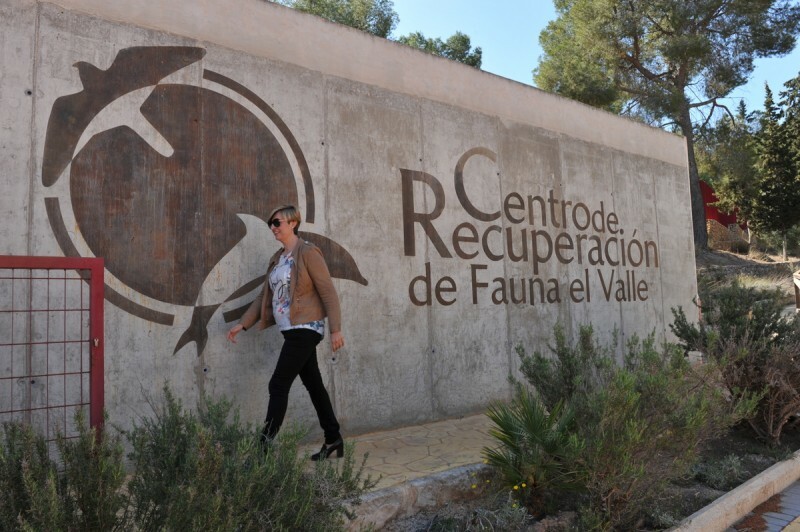 If you want to see the most stunning of all, go to Murcia on the "day of the Salzillos" and if you can´t do that, at least go to the Salzillo Museum and see the great pasos which are on display all year around, albeit without their floral decorations. The pasos are transported on enormous structures known as tronos, thrones, which bear the pasos and their accompanying decoration. These are usually floral, intertwined with sumptuous fabrics, fruits and candles and are not only vast, but unwieldy and heavy. Cartagena takes tronos to another level, with vast swaying structures of inverted chandeliers and extravagant floral displays, which are so enormous that watching them trying to exit the church is an entertainment in its own right, some only squeezing through the doorways with a cm or two to spare on either side. One gladioli too many really could spell disaster. 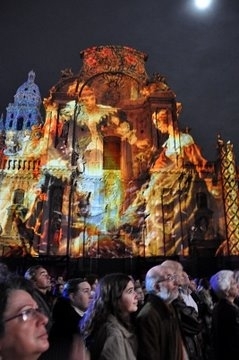 In Murcia, the quality of the sculptures is unsurpassed, the Friday morning procession of the Salzillos including some of the greatest baroque masterpieces the region possesses. Each town and city has its own peculiar character and each procession has a unique atmosphere of its own due to the manner in which they take place. In Cartagena the narrowness of the streets and size of the tronos is not only the reason for the rigid military discipline of the silent lines of penitents: there is also fierce rivalry between the Cofradias, as navigating the tight corners with only cm to spare is incredibly difficult, whilst in Lorca the rivalry is on display for all to see - will the whites or the blues sell the most tickets and outdo each other in the magnificence of their displays and the breathtaking daring of their horsemen. 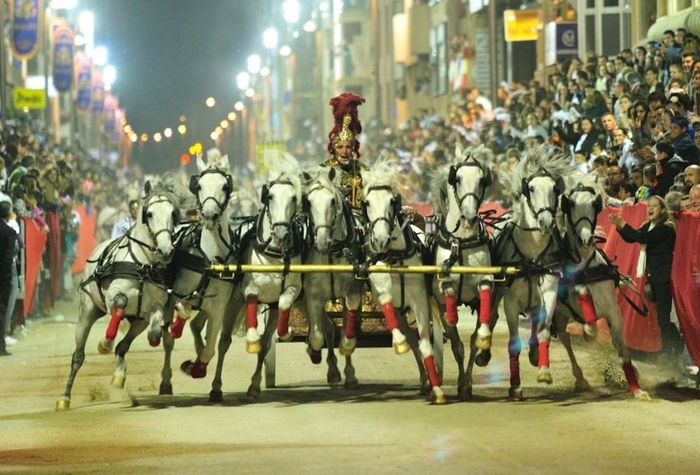 You´ll see some of the tronos on wheels in Cartagena, due to their sheer weight but elsewhere they´re borne on the shoulders of members of the Cofradias, who are known collectively as Nazarenos. The name of those bearing the tronos varies from place to place, but you´ll see the names costaleros or portapasos also used, due to the little pad, the costal, which they wear on their shoulders to ease the burden of the tronos, which can easily weigh a ton. It has been estimated that each costalero bears 100kg, which can weigh very heavily when the parades last for several hours, as many do, although bearing this weight is a tremendous honour and its done with great pride. The Nazarenos all wear distinctively coloured robes, and carry extravagantly embroidered standards bearing their insignia, which also appear on their robes. 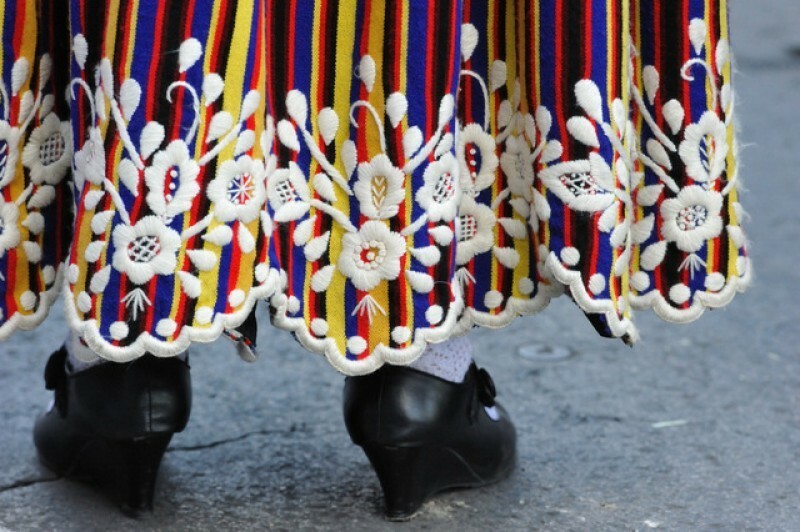 Some are full length, others knee length and are known by various names across Spain, San benito, zamarra or abito. These robes go back to the days of the Spanish inquisition, when those convicted of heresy against the church were forced to wear robes bearing symbols and inscriptions as a mark of their shame, being easily identifiable and reviled as having sinned against the church. 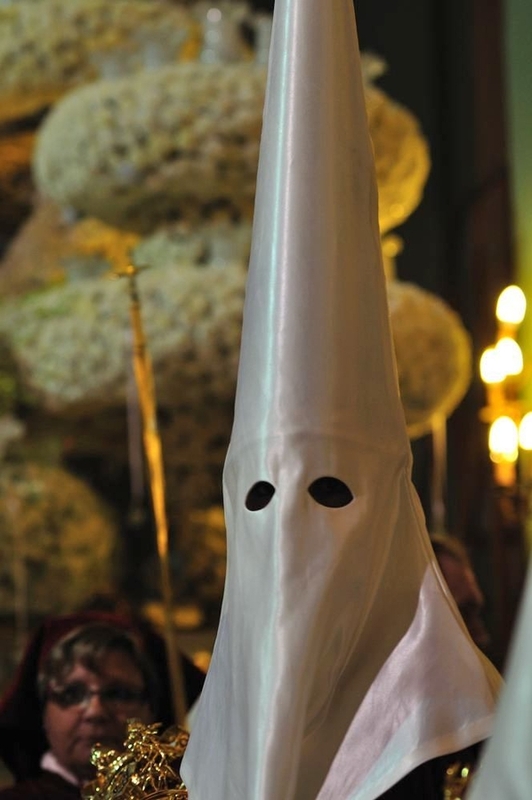 They were also forced to wear a hat, which has evolved into the capirote, the distinctive tall, pointed hat that is so widely associated with Semana Santa today. You will also see penitentes, who sometimes carry wooden crosses and have no point in their hats, some of whom walk barefoot. Participation in the parades is an act of penance, so the normal procedure is to walk in silence, faces covered, solemnity the order of the day, particularly on the Thursday evening when lights are extinguished and the penitents walk in absolute silence. Again, each area has it´s variations - in Murcia capital the robes are short, knee length, with distinctive hand crocheted stockings, stuffed with food so that gifts can be handed to onlookers throughout the route, in Lorca the caps worn by the participants are unique and the embroideries astonishing, whilst in Jumilla the loose tunics are totally distinctive compared to those of, say, the sleek satins of Cartagena. Each procession represents part of the week, so on Palm Sunday, known here as passion Sunday the mood is of celebration as Jesus enters Jerusalem on a donkey, by Wednesday the mood has turned to despair, by Thursday lights are extinguished as the Nazarenos march through darkened streets, remembering the betrayal and taking of Christ and on Friday, all are in mourning for the death of Jesus. Saturday is a day of reflection, of contemplatiion following the passion of the crucifixion, then on Sunday the mood changes to light as white flowers and shining white robes celebrate the resurrection. You´ll generally find the processions in the first part of the week lighter in spirit, families walk together, often giving out sweets, and in Murcia City the Wednesday procession of the Coloraos, the reds is an uniquely wonderful experience when robes are filled with food to share with the crowds lining the streets, the atmosphere happy and open. Other names you will come across this week are Auto sacramental, which is equivalent to a passion play, many texts dating back to the 17th century and still widely performed in churches today. There are choral performances all over the place, treat after treat as the churches and plazas are filled with beautiful choral music, and all the concerts are free. There are 14 of them, and in every town and village you will find a route which marks these 14 points at which the Via Crucis stops. 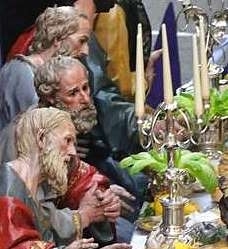 One which is of particular note is in Totana, where they have a beautiful sculptural Via Crucis, Click Via Crucis, Totana. During lent the faithful walk the Via Crucis, with readings and prayers at each station. These Via Crucis are often at night or early in the morning. They take many forms, and as we near Semana Santa it is quite common for the Via Crucis to take the form of a theatrical representation, with performers acting out each station as it is reached, or in others, the reading of text and prayers are offered. I will never forget the night that as a newly arrived, bewildered ex-pat, who spoke no Spanish and had inadvertently bought a house with a station on its wall, I followed the crowd who were outside my front door with no knowledge of what was happening, intrigued by the soldiers, the strange figures in sackcloth and the accompanying donkey, to witness the simulated crucifixion of a man in the church square of Moratalla, with the darkness and the wind howling as the cross was raised, blood pouring from the ropes that tied his wrists to the cross, lit by a solitary spotlight as the silent crowd of hundreds stood mesmerised watching him die. I still find a deep emotional pleasure in following the route of a Via Crucis and being part of the experience, and they´re all different. Some of them leave at the crack of dawn- throughout lent they have been leaving Murcia Cathedral before daylight breaks, and youll see them celebrated in many forms throughout Murcia. Each parade is different, each town and village is different. 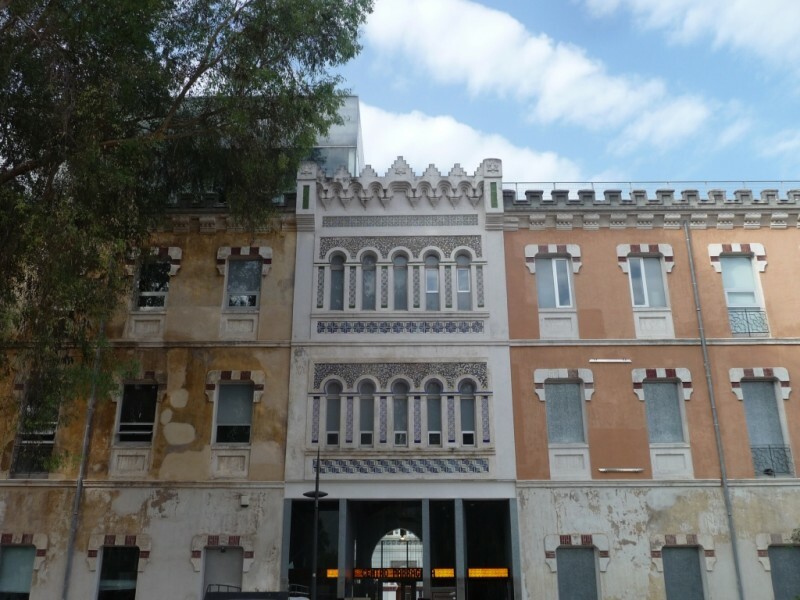 If youve been to Cartagena once, try a different night and if youve only ever been to Murcia, go to Alhama or Totana and feel the swish of satin as it brushes against your legs, smell the flowers, and crush against the narrow streets as the tronos squeeze past. Many find the larger processions in Murcia impressive in their scale, or those of Cartagena mesmerising in their precision and control, others enjoy the sombre mood and atmosphere of the Thursday night processions of silence, whilst others prefer the intimacy of atmospheric towns, where the streets are barely wide enough to accommodate the processions. Some love the explosion of celebration on a Sunday morning, Alhama being particularly noteworthy for its congregation of pasos and stunning flowers, and some are blown away by the incredible spectacle of embroidery, light and Broadway-scale processions which are unique to Lorca, whilst yet others are mesmerised by the purity of a saeta ( a simple song) ringing out in the streets as the tronos sway from side to side and the crowd stand in respectful silence. And the joy of this week is that every town is unique, every tradition unique, and each way of celebrating Semana Santa unique, which means that no matter how long you´ve been here, you´ve never truly "done " Semana Santa in Murcia.